JU VC Prof R D Sharma speaking at workshop on Tuesday. JAMMU, Feb 24: Department of Zoology, University of Jammu and J&K State Council for Science and Technology today organized a one-day workshop on “Patent Designs, Trademarks & Intellectual Property Rights’. Speaking on the occasion, JU Vice Chancellor, Prof R D Sharma said that these are exclusive rights over the intellectual property granted to creator or holders which protect their rights from misappropriation by third parties without their authorization. “It is our responsibility to educate the younger generation and cultivating in them the awareness on the importance of respecting and protecting these rights” he added and hoped more such workshops would be organized in future also to sensitize the researchers and students on such important issues. Earlier in his presidential address, Prof K K Sharma, Dean, Faculty of Life Sciences, threw light on the Intellectual Rights and Copyright, patents, trade and service marks etc. He said that the aim of the workshop is educating and informing the younger generation on the importance of reducing piracy of the research and other works that are being carried out by them. Parvez Ahmed Malik, Secretary to Government, S & T and IT Department and Shafat Sultan, Additional Director, JK Science & Technology spoke about the various activities being carried out by the Department of Science and Technology. They also informed that a Patent Information Center has been sanctioned which will be in place by May 2015. In the first technical session Prof Ashwani Wangnoo, HoD Environment Science and Limnology, Barlatullah University Bopal delivered a key note address on the topic “Patent & Copy Rights”. 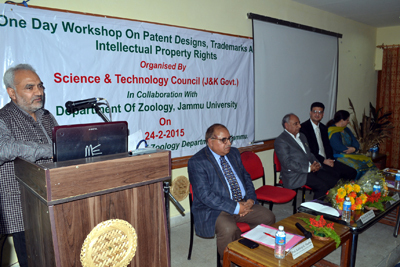 Er Manik Gupta, Registered Patent Agent, Jammu spoke on the topic “Role of Patents in 21st Century”. The programme was coordinated by Prof Roopma Gandotra, Head, Department of Zoology and Shruti Khanna, Programme Co-ordinator of Science & Technology.